…and they kinda live up to it. I have some trepidation about anything that calls itself “gourmet.” It’s one of those adjectives I think you need to earn. Just adding it to a description, and especially a name, doesn’t make it such. Plus, what does “gourmet” really mean? Is it made with better ingredients? More care? By people who know what they are doing compared to the other average candy makers? 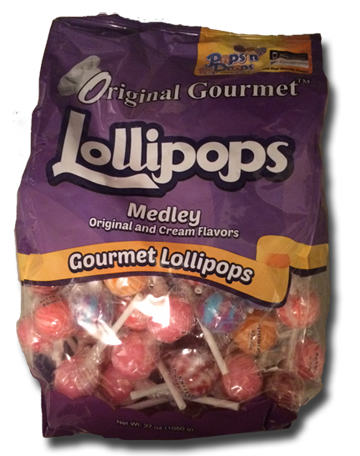 This is my initial cynical head space when I decide it’s time to tear into this huge bag of lollipops from the … wait for it … Original Gourmet Food Co.
Not sure how to rightly define gourmet but I would start with flavor, and these things have them. What a pleasant surprise. 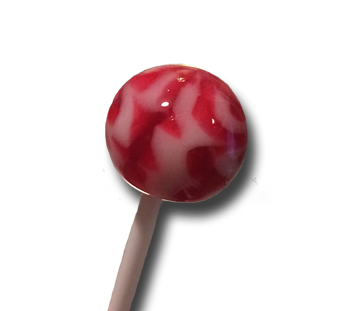 The cherry cheesecake absolutely has a maraschino cherry flavor and not a general red=cherry flavor. The cheesecake is there too – almost dulling the sweet cherry and giving it a creaminess. Color me impressed. I went for cotton candy next because I actually think it’s a hard one to do right in any form that isn’t actually cotton-like candy. And guess what – the flavor is spot on. Honestly, I went into this review thinking I was going to pan the living crap out of these things. I figured I’d try 1 or 2, take a few licks, throw out, and write. But that ain’t what’s happening. At this point I’ve eaten 5 flavors, all good, all taste as advertised, and I’m finishing the whole pop. Great for me abs! – The size. 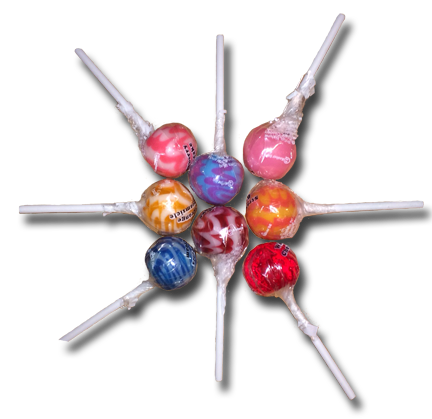 A little smaller than the large gum balls you’d get from one of those machines at the market for a quarter, these are the perfect little flavorful dessert at only 40 calories and no fat. – Made with sugar, not high fructose corn syrup. The only thing that I have a small issue with is the individual pop packaging plastic, which is wrapped around the stick pretty tight. For a few of these it was a bit hard to take off, took some wrestling. But I can live with that. These folks sent me a huge bag and I was just about to put in my car to take to work and share…but now I think I’m going to keep them at home. Because I’m a gourmet, and us gourmands are discerning about who we share our candy with.